A second ranking system, ranging from #1 to #4, is also in use. This system was developed by the famous manufacturer of Conté crayons and adopted in the US by John Thoreau, father of poet Henry David Thoreau. The exterior colour of the pencil generally depends on its country of origin. They’re yellow in the US, green in Germany and Brazil, dark red or black in the southern European countries and red with black bands at one end in Australia. Pencils are often hexagonal in shape and encased in wood to protect the fragile graphite within. We’ve broken this article down into several smaller sections to make it easier to navigate and read. You’ll find information on standard graphite pencils immediately below this introduction. Then, we take a closer look at carbon, charcoal and ebony pencils, followed by a brief review of pigmented and woodless varieties. Finally, we examined the various options available with regards to coloured pencils and coloured pencil blenders. In each section, we describe each product and present artists’ feedback on the leading brands in each category. WonderStreet is not connected to any of the brands listed herein. Reviews were gathered from our own community of thousands of artists and from the websites of online retailers. Please remember that a “pro” for one artist may be a “con” for another and that your experience with these products may be different from the experience of others. It is also worth noting that the surface that you choose to use a particular pencil on can have a dramatic impact on its overall performance. Most artists use either paper or "board," which is essentially a very thick paper that can be finished on just one side (Illustration board) or on both sides (Bristol board). Different papers can also have different weights and textures. Some can be made from hemp or other natural fibers. Vellum has the feeling of smooth parchment, which was traditionally made from calf's skin, but is no longer made with animal products. Newsprint is a thin, cheap paper that becomes discoloured quite easily and fades over time. Regardless of the surface you prefer, you should be aware that not all pencils are designed to interact well with all surfaces. Choose a complementary combination to get the most out of your pencils. At the end of this article, we present our “Final Thoughts” to summarise our findings and to make recommendations based on the feedback we received. We encourage you to share your own observations and opinions about pencils in the comments section. Graphite pencils are perhaps the most familiar type of pencils with their grey “lead”, which is actually not made of lead at all. These pencils are used for sketching and drawing. Juniper or incense-cedar wood are frequently used for the bodies and erasers may be attached to one end with a metal ferrule. There is an overwhelming consensus that Blick’s Studio Drawing Pencils offers one of the best values on the market. Reviewer after reviewer stated that the product is as good, if not better, than some of the more high-end options in this category and at a fraction of the price. This brand is favoured by teachers and other individuals who often have to purchase drawing pencils in bulk. Though there were a few complaints about the consistency of the lead, most were pleased by these pencils’ ability to hold a sharp point and the overall quality and feel of the product. This product is one of the more expensive available. However, several reviewers maintained that the quality is very much in line with the price. The barrel of these pencils are somewhat larger than those of the other products in this category. Some artists found that to be a benefit because it gave them a more secure grip on the pencil and more control. However, many noted that the Caran d’Ache Grafwood Pencils do not fit into standard electric pencil sharpeners, so you’ll have to purchase an electric sharpener with an adjustable opening or sharpen them manually. Cretacolor is the descendant of the company started by Joseph Hardtmuth in 1790, which manufactured the very first graphite pencils using a mixture of graphite and clay. The lead is incredibly soft, which some described as having a buttery consistency. However, this level of softness does make the pencil difficult to sharpen in an electric sharpener, so manual sharpening is recommended. One thing that many of our artists liked about these pencils is that they don’t scratch when they’re moved across the paper. This brand is favoured by many professional artists because of its smooth blendability. However, some artists complained about the hardness label only being printed on one (of six) facets on the pencils. It is generally much more convenient to have this printed on at least three of the facets so that artists don’t have to search for the label while they’re working. There does appear to be some disagreement about whether or not the pencils contain some larger chunks of grit, causing the pencils to scratch the paper, so we imagine that there must be some variation among the individual products. It was difficult to find “cons” for this beloved brand of drawing pencils. The artist reviews were glowing on account of the quality and dependability of Faber-Castell’s 9000 Pencils. Though a somewhat pricier option, it appears that you get what you pay for with this product. Application is smooth and the pencils handle well. One aspect that stood out was the matte finish produced by the Faber-Castell pencils. Lower quality pencils will produce a shiny finish that most artists don’t like for their drawings. Though this brand does have its fair share of fans, there were a lot of negative comments about the quality of graphite used for this product. Several artists reported that pieces of grit would routinely break off of the pencil point and scratch the surface of the paper, damaging and destroying projects. Additionally, the grading system for hardness and colour appears to be misleading. All in all, General’s Kimberly Drawing pencils seem to offer more risk than reward and there are many other products available in this category with less negative feedback. Prismacolor Turquoise Drawing Pencils used to be a favourite among artists and still enjoys its fair share of supporters. However, we read numerous complaints that the overall quality has dramatically deteriorated since the brand moved its manufacturing center from the USA to Mexico. Now, the pencils have off-center leads and a gritty texture, though it’s unclear whether or not the move had anything to do with the change. Many artists say that Prismacolor is not worth the premium price and that they have switched to other brands for pencils. While most artists who use Staedtler Lumograph Drawing and Sketching Pencils are fairly pleased with their results, there were several who noted that some of the grades, particularly the softer 7B and 8B grades, don’t perform as adequately as the others. In general, reviewers find this brand to be reliable in terms of quality and affordable in terms of price. One aspect that they really appreciate is the strength of the lead, saying that it very rarely breaks. One of the most positive aspects about this brand of pencils is that it doesn't have the same graphite "shine" that is so typical of many other products. It has a more matte finish because it has a higher proportion of carbon. There is a wide range of contrast, they sharpen well and are quite soft. They are best suited to expressive sketches and portraits. However, this softness means that the pencils do tend to smudge on the paper and can be somewhat difficult to blend and erase. This is also one of the pricier brands of pencil currently available on the market. Artists like Tombow Mono Professional Drawing Pencils not only for the graphite inside, which maintains a sharp point and does not require frequent sharpening, but also for the wood and general look of the pencils. This Japanese manufactured brand has a very elegant design and is made from very high-quality soft wood. According to reviewers, the lead in the Tombow pencils break with some frequency and may not necessarily be worth the high price, however, they are very responsive and sensitive to every movement of the artist’s hand, so they remain a favourite. These three types of pencils are generally softer and darker than the standard graphite variety. They’re most often used for shading and blending. Charcoal pencils are made from compressed charcoal, which is encased in wood to keep the artist’s hands clean and make it easier to draw fine lines and details. Carbon pencils are a mixture of graphite and charcoal. Ebony pencils are made with a special kind of dark graphite. Conté has been well-known for its line of crayons, made with coloured wax or chalk, for over a century. Its line of sketching pencils also has a group of loyal fans. This is one of the more expensive products on the market. However, the pencils are nearly twice the size of every other brand in this category, so the Conté pencils last twice as long. Many artists also appreciate how the larger size feels in the hand. However, the gritty consistency and regularity of breakage are some obvious disadvantages to this product. This product is a mixture of graphite and charcoal in one pencil, which makes for a unique drawing experience. Carbon pencils are great if you want the effect of a charcoal pencil without all of the mess. As with charcoal, it’s best to use a thicker paper to ensure that the medium bonds with the support. These pencils can be somewhat difficult to sharpen because the lead is so soft, but this is a plus for many artists because it also means that the application is smooth. This product is not very durable. Several mentioned that the leads break easily. One reviewer even suggested making a square wood grip to ensure that the pencil would never run off of a table. However, despite the rather short lifespan of these pencils, they impress in terms of quality and versatility. They blend well and are used by professional artists in a variety of different fields. Aside from the weakness of the lead, the second biggest complaint was that the product line does not offer a “jet black” colour that buyers anticipate when they purchase Prismacolor Ebony Pencils. This product solves the issue of crumbly mess left behind after you sharpen a charcoal pencil. Rather than sharpen, the artist who uses Prang Wrap Charcoal Pencil can simply peel away some of the wrap to access fresh charcoal below. Some reviewers found the wrap to be somewhat difficult to work with, but most were pleased by the overall quality of this product. They can be used in a variety of different artistic situations and are relatively affordable. A major concern with the Ritmo Charcoal Drawing Pencils is the manufacturer’s quality control. Many reviewers complained that they received pencils that had obviously been dropped or damaged in some way because the charcoal centers of the pencils were pulverized, making them impossible to sharpen. For those who received non-defective products, the dark colouration and smooth application to the support were quite enjoyable. Unlike many other product in this category, Wolff’s Carbon Pencils do not break easily. They maintain their point because of their small leads, which are also quite easy to sharpen. This point makes it possible to draw very thin, but solid, lines. Some grades produce a very dark colour, which one artist likened to ink. These pencils also do not smudge very easily, which is better for the artist who favours a neat and controlled composition. As the name would suggest, pigmented sketching pencils contain small amounts of pigment. The pigments are mixed with graphite, which gives them a somewhat muted appearance, but they can add some serious visual interest to an otherwise monochromatic sketch or drawing. This product combines a traditional graphite pencil with some subtle hints of pigment. They can be mixed with water to activate and release the pigment within so that the colours become more vibrant. Most of the artists who reviewed this product really enjoyed it, but cautioned about the unpredictability of the colours. Their advice was to make a sheet to show each colour wet and dry so that the results would be more as expected. Derwent might be the only manufacturer to produce tinted charcoal pencils, so the singularity of this product almost deserves its own category. It allows artists to go beyond the typical monochromatic palette of charcoal drawing and infuse some colour into their compositions. However, the range of colours available is rather limited and the colours are not very vibrant. These pencils are also quite tricky to sharpen, as they tend to crumble, so it’s recommended to use a craft knife and sandpaper rather than a sharpener. Woodless pencils are simply graphite pencils without the wood casing. Most are painted with a coat of clear lacquer to protect the artist’s hands. They are generally considered to be a good value because you essentially get the same amount of graphite in one woodless pencil that you would normally have in two standard pencils. It is even possible to use the side of woodless pencils for shading and to achieve various effects. Though they are difficult to sharpen, many artists noted that it’s easier to sharpen Cretacolor Monolith Woodless Pencils than many of the other brands in this category. This product blends well and can create a variety of different values just by adjusting the pressure of the hand. It’s also less messy than some of the competitors. However, several stated the pencils break easily and that they can snap in half when dropped on a tile floor. General’s Pure Woodless Graphite Pencils offer the best product in terms of durability within this category. The pencils do not break easily and they are very smooth and creamy in consistency. The price is in line with the quality and the only major complaint is that it’s difficult to maintain a sharp point, requiring constant re-sharpening. Fortunately, these pencils also sharpen quite well. Many reviewers said that their favourite thing about these pencils was the way that they feel in the hand. The weight is very well-balanced and even though the graphite can rub off and become a little messy, the overall quality of the pencils is quite high. Most agreed that the application is smooth and not gritty. The only other downfall is that sometimes several applications are needed to provide adequate coverage. Coloured pencils do not contain graphite. They are made from pigment, oil or wax binding agent and additives. In this section, we’ve reviewed several brands of artist-grade coloured pencils. These professional tools contain more pigment than the standard student-grade pencils and are also intended to be more durable. Like many of Blick’s other house brand products, the Studio Artists’ Colored Pencils are quite popular with beginners and artists on a budget. The price is quite low and the quality is sufficient, but not astounding. A few professional artists pointed out the low colour saturation of these pencils and that they lack the creaminess that is often associated with the high-end brands. The pencils are also prone to breaking when they’re being sharpened. It’s recommended to use an electric sharpener, instead of a manual, handheld one. The colour selection for Bruynzeel Design Colored Pencils was described as “interesting” by more than one artist. Some meant that with a positive connotation, others were more negative. The pencil sets are housed in a pretty wooden box with drawers that garnered a lot of praise, but they are quite difficult to sharpen and break easily. This might be due, in part, to the size of the pencil barrels. They are much thinner than many of the other products in this category. This is one of the most expensive products in the coloured pencils category. However, it does seem to be a favourite for many artists. The consistency was routinely praised and likened to oil pastel or oil painting. The largest set contains only 80 colours. However, they are quite easy to layer and blend, meaning that the possibilities for creating your own original colours are nearly endless. This brand is also well-known for the lightfastness of its pigments, which means that they hold up under extended direct exposure to sunlight. Drawings made with Caran d’ Ache Luminance Colored Pencils can be expected to remain vibrant for many years. Caran d’Ache’s Pablo Colored Pencils are harder than the Luminance line, but share the same standards of quality. Artists are pleased with the selection of unique colours and the way that the pencils sharpen. The lead is always centered and it’s very easy to maintain a sharp point. As with most high-end products, the price can be somewhat restrictive for artists on a budget. However, like many other brands, Caran d’Ache also sells “open stock,” which means that individual pencils can be purchased – a much more manageable investment than a box of 80 or 120 pencils. The range of colours available in the Derwent Coloursoft Pencils line is what makes this brand so popular. Many of our reviewers particularly liked the set of 6 skintone pencils. They have a nice, creamy consistency and blend well. One downside is that they do not fit into most standard size pencil sharpeners. The barrel is too wide, so it’s necessary to purchase a special sharpener or sharpen them manually with a knife and sandpaper. PROS: subtle colours, buttery texture, good way for students to introduce colour into their compositions. Artists love to mix Derwent Drawing Pencils with other media, such as coloured pencils or pastel crayon. The colours are subtle and go on smoothly. The China White Derwent Drawing Pencil, in particular, was recommended for every toolbox. The colour range is considered sufficient by many landscape artists and while some appreciated the soft pliability of this product, others found it annoying to have to constantly re-sharpen the pencils so that they would maintain a point. If you like to have soft pencils and vibrant colour in your compositions, Derwent Studio Colored Pencils may not be the best product for you. Though the quality is still undeniably high, Derwent’s Coloursoft Pencils line is quite different in its consistency and result. Because of their hardness, the Derwent Studio Colored Pencils are quite durable. They are also useful for very fine detailing because they maintain a sharp point. Because Faber-Castell Polychromos Pencils are made with an oil binder instead of wax, there is no bloom, which is the case with several other pencils in this category. Wax bloom is a milky white haze caused by a build-up of wax, which is unattractive and undesirable in a composition made with coloured pencils. It is an unfortunate side effect of using many of the wax-based products in this category. Polychromos pencils can be sharpened to an ultra-fine point and lay down quite smoothly. They are great for blending and layering, and some artists noted that a pairing is possible between this product and Caran d’Ache’s Luminance line of pencils. Manufactured in Japan, Holbein Artist Coloured Pencils are noted for their rich, creamy consistency and ability to easily fill an entire page of paper with colour. They are well-packaged with foam inserts to protect each pencil, in boxes offering a wide range of colours. However, it can be difficult to obtain just one pencil, if you need to replace just one in your set. Boxes are quite expensive, so this is not ideal if you tend to use some colours more frequently than others. Also, many reviewers complained that these pencils cannot be layered as nicely as many other brands. These pencils are one of the harder options in this category. However, their application is still quite smooth. This brand also offers the best in terms of one-of-a-kind colours. There are three sets of 30 pencils that are designed for landscape drawing called Rainforest, Seascape and Woodlands. The packaging is well-designed and portable. The most notable complaint was that the Irojiten Color Pencils can be difficult to sharpen – they sometimes splinter and crack when they’re being sharpened. As with woodless graphite pencils, the benefit to using a woodless coloured pencils is that you get more medium for (nearly) the same price. They are a lot easier to sharpen and less wasteful, as well. Many reviewers were disappointed with the number of colours available and noted that it wasn’t possible to mix and layer every colour that they required. Additionally, the pencils are somewhat fragile and the leads usually break if they are dropped on the floor. This is another brand of pencils that is oil, rather than wax, based. This means that there is no wax bloom and also that the application is very smooth. Several artists remarked on the comfort of these pencils. Because they lay down so easily on paper, there’s no need for excess pressure from the hand while blending and layering colours. 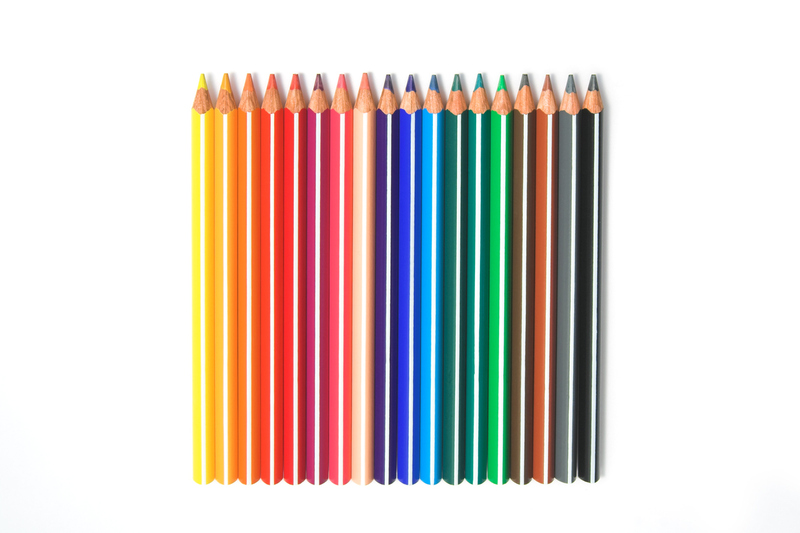 Lyra offers a wide variety of colours, but the cap on the pencils are not always accurate, so it’s advised to make colour charts before using this product. Art Stix is Prismacolor’s line of woodless coloured pencils. They are best for filling in large areas with colour in a short amount of time and for blending. One thing that artists love about these pencils is that they match very closely to Prismacolour’s other lines of coloured pencils, which makes it easier to combine materials and use other tools for fine detail work. Unfortunately, the selection of colours available is quite limited. This brand is, far and away, the most popular in the coloured pencil category. From reading a wide range of consumer reviews we found that artists and hobbyists alike are quite pleased with the overall quality. However, some longtime users noticed a higher frequency of defects, like other Prismacolor products, since the company moved its manufacturing center from the US to Mexico. Some common complaints were that the leads broke during transport and that the leads are off-center, making the pencils more challenging to sharpen. This product from Prismacolor appears to be favoured by adult colouring book enthusiasts for the accessible price, but professional artists were frustrated by the inferior quality. Many complained that the pencils break too easily and are very difficult to sharpen to the fine point that is needed for detail work. Some also stated that the consistency can be somewhat “crumbly,” which is not at all desirable. Coloured pencil blenders are used in conjunction with coloured pencils to correct mistakes and create a variety of finishing effects. They are colourless and most often made with a combination of oil and wax. This blender can be used to mix and soften colours. It can also be used as a burnisher to provide polish and shine to a finished coloured pencil piece. This combination saves artists a step and plenty of valuable time. It is woodless, which means that it consists of pure blender and only a clear protective coat on the outside. It also means that the pencil is not very durable and that care must be taken while sharpening it to prevent breakage. This product burnishes well, but many said that it does not adequately perform its function as a blender. It is oil-based, so it’s possible that this can account for some of the perceived shortcomings. It is a durable product and doesn’t break as easily as the other two brands presented in this category. It’s also quite a bit softer than some of the competitors’ products. This blender maintains a sharp point very well, which allows it to fit into tight spaces and to blend very fine details. However, like many other Prismacolour products, the lead is off-center, which can make sharpening the pencil a challenge. Some artists noted that it leaves behind an unattractive yellow colour. There also seem to be some differences from product to product, which would indicate a quality control issue. When it comes to pencils, there is a lot of room for personal preferences. For standard graphite pencils, Faber-Castell 9000 Pencils appear to blow all of the others out of the water with generous praise for their consistency and beautiful matte finish. Tombow Mono Professional Drawing Pencils are also well-reviewed for their responsiveness. However, both of these pencils are quite expensive. A reasonably-priced alternative that doesn’t require much sacrifice with regards to quality is Blick Studio Drawing Pencils, which are beloved by art teachers around the world. Aside from standard graphite pencils, there are a number of other types of pencils used by artists. Wolff's Carbon Pencil emerges as a leader in the charcoal, carbon and ebony pencils category. It’s the only product that does not break easily and does not leave a mess on the artist’s hands and paper behind. This pencil is perfect for making dark, fine lines. Derwent Graphitint Pencils are pigmented graphite pencils, which – as the name suggests – is a mixture of graphite and pigment. Artists were pleased with the vibrancy of colour and smooth application of this product. Because of their durability, General's Pure Woodless Graphite Pencils are the favourite among artists who prefer the flexibility and value of a woodless pencil. Because these pencils are pure graphite, artists get twice the medium in one pencil. In the coloured pencils category, Prismacolor is one of the most recognized names. However, recent feedback has not been positive. One of the most favoured pencils for artists who prefer a softer lead is Caran d'Ache Luminance Colored Pencils because of their oil pastel-like consistency and their lightfastness. Those who prefer a harder lead will like Caran d'Ache Pablo Colored Pencils, Derwent Studio Colored Pencils and Irojiten Color Pencils. The latter is also noted for having the widest range of colours available, including three sets designed specifically for the landscape artist. There seems to be a great deal of disagreement on the best coloured pencil blender, but Caran d'Ache Full Blender Bright offers both blending and burnishing capabilities, which makes it worth the higher price. Which brands of pencil do you like best? Please tell us which ones work best for you in the comments section below!